That Woman by Anne Sebba is a biography of Wallis Simpson, Duchess of Windsor, wife of the Duke of Windsor, the former King Edward VIII, and blamed for his decision to abdicate in 1936. Hated by the royal family, particularly Queen Elizabeth the Queen Mother, and mocked by society, history has painted her as a manipulative and cunning woman, allegedly using tricks learnt in Chinese brothels to exert her hold on the King. Born Bessiewallis Warfield in Baltimore in the late nineteenth century, she was on her second marriage by the time she met the then Prince of Wales. Her first marriage was as a naval wife and ended in divorce, she spent time in China before moving to England and marrying Ernest Simpson, who offered her stability. Soon they were moving in society circles which were really outside their financial means, and it was here she met the Prince of Wales, who at the time was infatuated with Freda Dudley-Ward. He transferred his affections to Wallis however, and soon came to rely on her for everything, indeed he found it difficult to do much without her present. When he acceded to the throne on the death of his father, he was determined to marry Wallis. The royal family would not even entertain the idea of a twice divorced woman married to the king, even if it was a morganatic marriage and she was not called queen. The king decided to abdicate, as he could not imagine living without Wallis as his wife. The rest, as they say, is history. Prior to reading That Woman, I knew very little indeed about Wallis Simpson. What I had read tended to be in royal biographies, and would give the perspective of the royal family, which was not favourable. Yet I’ve always believed that whatever faults Wallis may have had, theirs must have been a great love for the king to turn his back on the duty and responsibility he had been raised from birth to carry out. From early on, Sebba’s account lacks a certain authority. She writes reasonably well, and seems to cover Wallis’s life quite thoroughly, yet there is a slight sense of sensationalism. She latches on quite strongly to the idea that Wallis was physically sexually dysfunctional, possibly without fully formed female sexual organs. This was news to me, and despite my lack of knowledge on Wallis, I would have expected to have heard something of this before, given that a physical dysfunction of this sort in the woman who brought about the abdication would be a huge story. Whether there is anything in it or not I can’t say, but it came across as sensationalistic, and Sebba almost seemed to be using it to add an element of interest to her biography. When she first presents the idea, it is as a theory, but as the book goes on, she gradually starts presenting it as fact, but with no further evidence to account for this change in stance. This element of the book aside, Sebba gives an interesting account of Wallis and her rather exceptional life. I could never quite decide whether Sebba was favourable to Wallis or not. She focusses a great deal on Wallis’s letters to Ernest before and after their divorce, the tone of which indicate that Wallis was not entirely happy about the course her life was taking, and that she seemed to be caught up in events beyond her control. This is very much a theme of That Woman, that Wallis wanted and tried to stop things before they went too far, and that she did not want the king to abdicate for her, but she had no control over events. On the other hand, we also hear about how Wallis kept pressing the king, or rather the Duke of Windsor as he was after the abdication, to get a good financial settlement for them, and also for her to have the right to use the title of HRH. Sebba is somewhat contradictory in these two areas of her work, first painting Wallis almost as a victim and then as the typical grasping woman wanting fame and fortune. From this point of view, the great love story was not so great. Of course the king was utterly devoted to Wallis and relied very heavily on her for support, but this wasn’t out of love in the traditional sense, but also because he was insecure and immature. Wallis did love him, but if she was indeed powerless to stop events, then that hardly screams of the greatest love of the century, as they have been described. After the excitement of the abdication, their story becomes a bit sad and pathetic. Their wedding was a small and fairly lonely affair, with few friends and no family attending. Aside from a spell in the Bahamas when the Duke was posted there as governor, they moved from place to place, filling their days with largely idle pursuits. The Duke never stopped trying to get a royal title for his beloved wife, while she always did her best to decorate their houses in the style to which he had become accustomed back home in the royal family. It all just came across as rather sad, never quite living up to the early promise of a wonderfully romantic life. 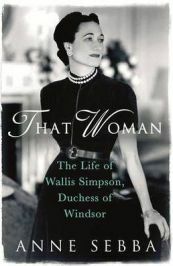 That Woman is an enjoyable and informative read, although I don’t think I would describe it as the ultimate biography of Wallis Simpson, even with my lack of prior knowledge. It lacks authority, and Sebba doesn’t seem to quite know what her stance is. There is an extensive biography included, and I’ll be having a look at that to see what else I can read on the subject. No Comments on "That Woman"